Once you’ve set up your Sleep, it lets you track your sleep without requiring any action on your part. All you have to do is lay in bed: it will do the rest on its own. Your sleep data is automatically sent to the Health Mate app shortly after you leave your bed. In some cases, it can take a few hours, depending on the quality of your Wi-Fi signal. You can retrieve the sleep data collected by your Sleep in your Timeline or on your Dashboard in the Health Mate app. 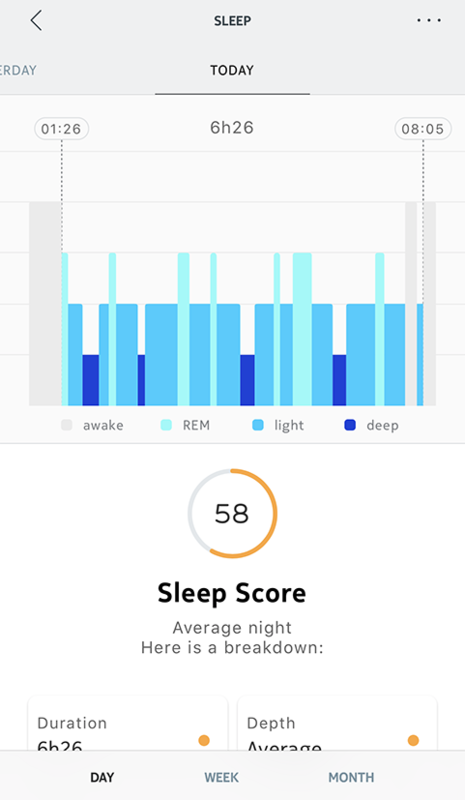 The Health Mate app keeps your entire history, allowing you to easily track how your sleep data evolves over time. Stage 1 is where we fall asleep. During this stage, you may occasionally experience muscle twitches or starts. Stage 2 is a light sleep stage, when you are easily awakened. Stages 3 and 4 are deep sleep stages. These stages are considered to be those where the body regenerates. People are difficult to waken during these stages. The final stage is known as REM sleep, for rapid eye movement. If you were to observe a person in this stage of sleep, you would notice their eyes moving under their eyelids, and possibly some muscle twitches. This is the stage of sleep when we dream. This stage of sleep is important in learning and in memory consolidation. The rapid eye movement sleep is a part of the deep sleep. Early in the night, we spend more time in stages 3 and 4 of each sleep cycle. As the night progresses, we spend more time in REM sleep. Whenever we are sleep deprived, our body will try first to catch up on deep sleep (stages 3 and 4) and REM. A person who is sleep-deprived will quickly fall asleep and move rapidly from light sleep (stages 1 and 2) to deep slumber (stages 3 and 4). It is natural for your body to alternate between light and deep sleep throughout the night. Though 8 hours is the sleep time objective, sleep needs are individual and you should consider your average deep sleep share over time to determine what level may be right for you and what factors affect the quality of your sleep.